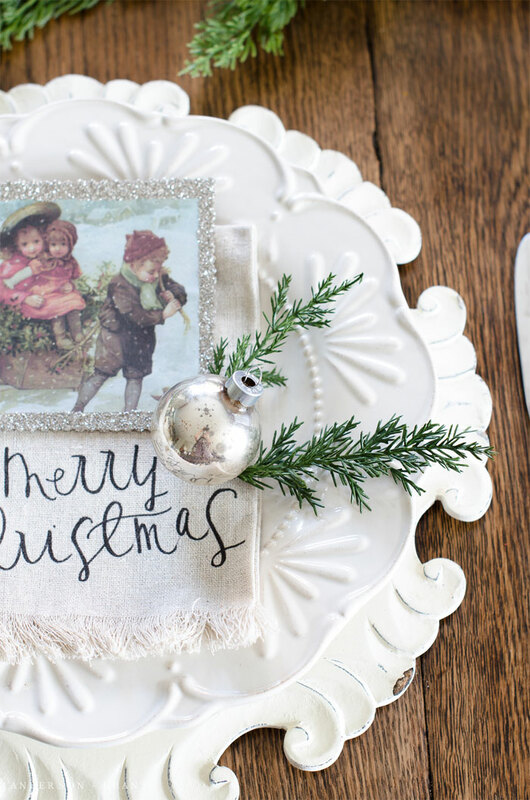 Create a unique favor for your Christmas table this year with a free printable of a vintage image. 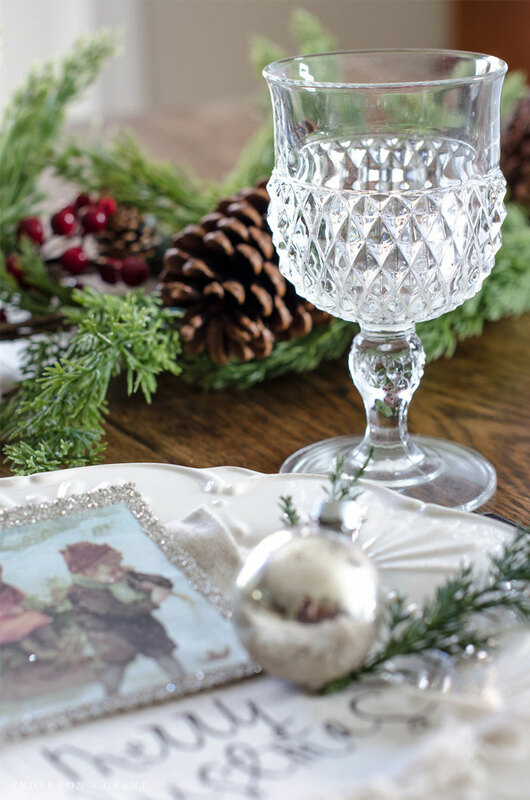 Even as a little kid, I enjoyed helping to set a festive table around the holidays. My favorite task was creating place cards for whomever was coming to dinner. Although we had the same guests year after year and they would sit in the same seats, I felt like these place cards were the most important thing on the table. 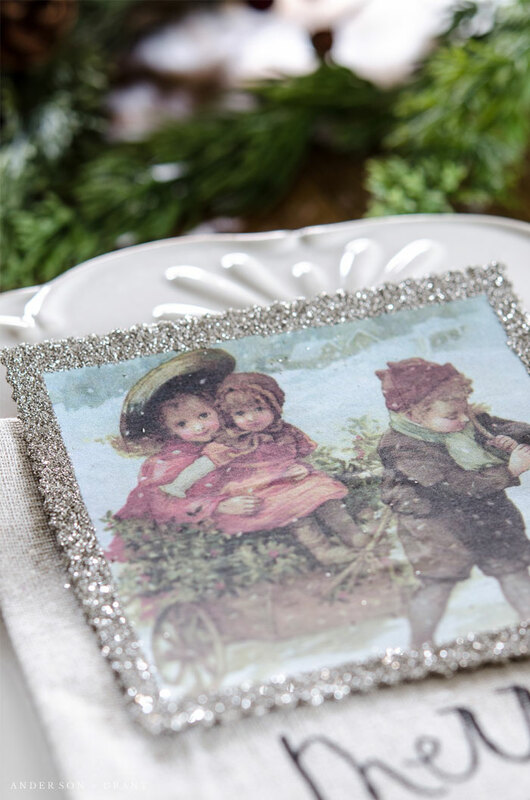 Creating favors was another way of putting my stamp on the holiday table all those years ago. 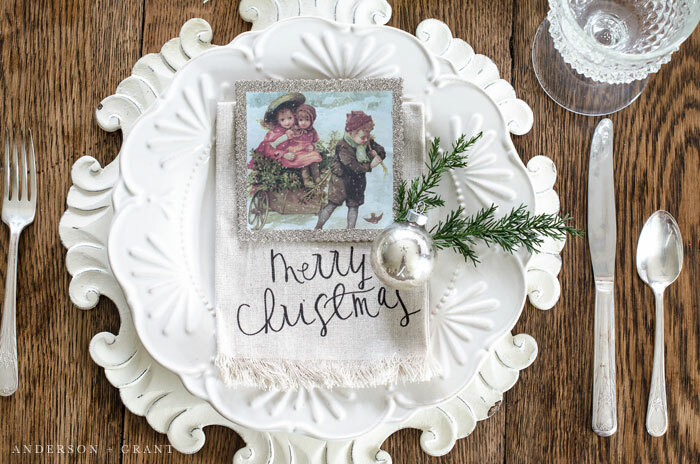 So when Kristen from Ella Claire Inspired invited me to participate in this year's Christmas Vignette and Printable Blog Hop, the first thing that came to my mind was creating a favor to give to each guest at dinner this year. 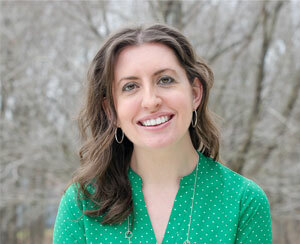 There are a few ways to view placing a favor at your guest's plate. One one hand, you can give those sitting down at your table a treat to eat like some candy or a piece of holiday fruit like a pomegranate. But those favors disappear by the end of the meal. 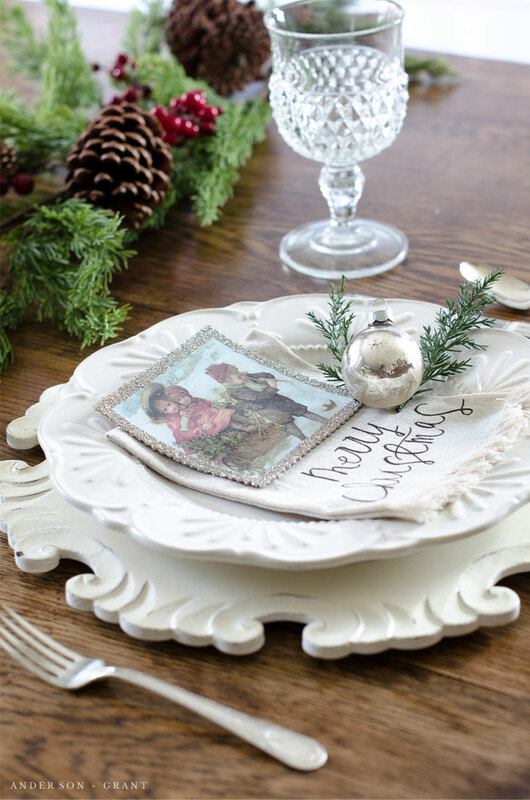 You can do something decorative like placing a pine cone or ornament in the center of their plate. But those things are just moved aside when the meal comes. 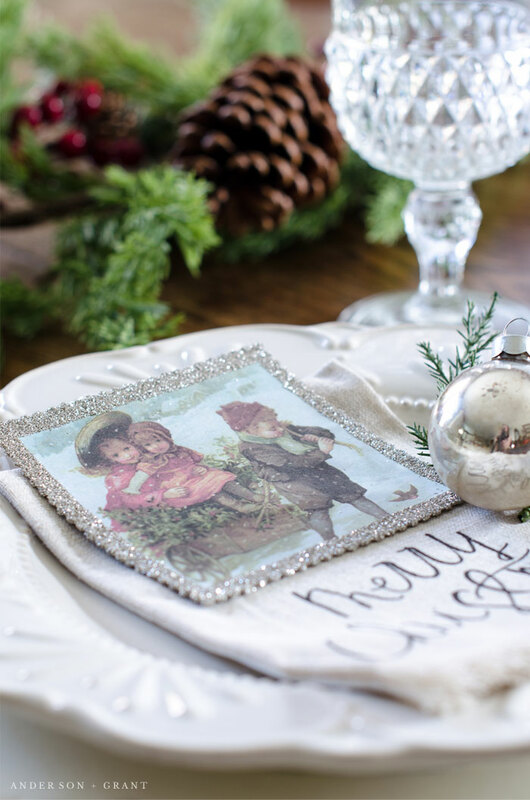 I enjoy using a favor that not only provides a decorative touch, but is something that my guests can actually use for many Christmas seasons to come. I like to think that next year, my friends and family can unpack the ornament that I've created for them and remember the time that they spent at my home and the happy memories we created together. 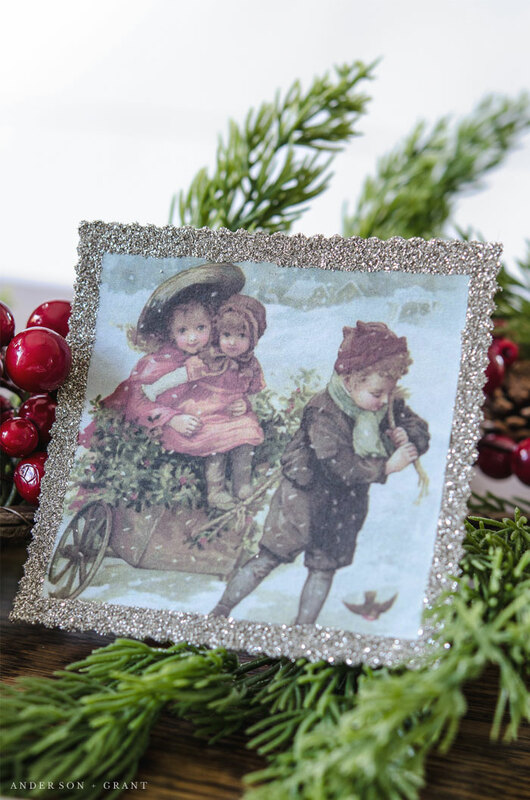 This vintage image is a charming picture that reminds me of what Christmas would have been like many years ago when families traveled long distances for the chance to spend their holidays with loved ones. Where gifts were simple and heartfelt rather than purchased because it is expected to give something. To make these ornaments, I printed the images out onto cardstock. Then I cut squares of chipboard with decorative edged scissors. You could also use the cardboard from an empty cereal box. I punched two tiny holes into the top corners and threaded fishing line through them to create an invisible way to hang the ornament. You could also use ribbon or twine depending on your style. 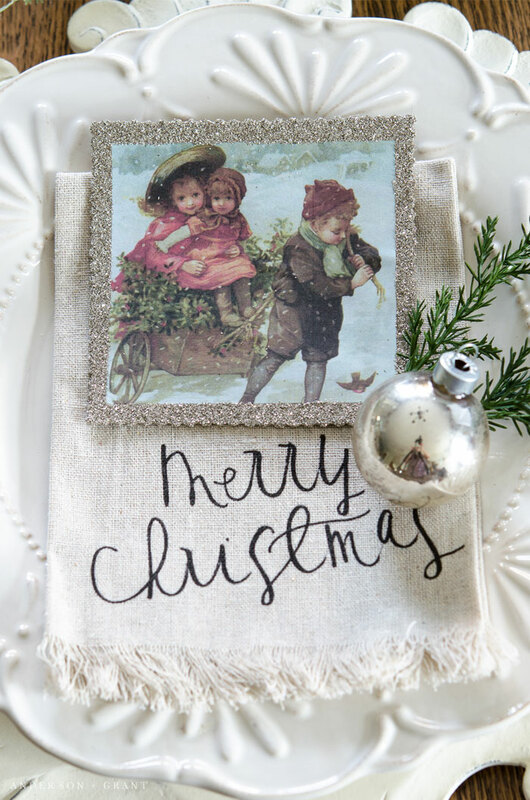 Last year, I got these pretty linen Merry Christmas napkins from Parris Chic Boutique and I think they are perfect backdrop behind the favor. It's like they were made for something to be placed on top of them! 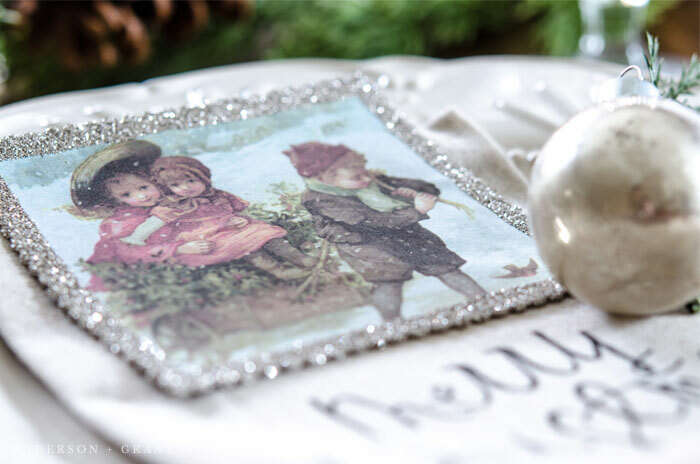 Maybe you aren't interested in making favors for this year's table, but this image can also be used to create ornaments on your own tree or to tie on the outside of a gift that you are giving to someone special. You could also print the image out and add it to a frame to decorate your home. Please remember, though, that these printables are free for your own personal use only. They are not to be altered, sold, or redistributed in any way. Be sure to visit some of these bloggers, see their creative printables, and be inspired by the ways that they've been used in our homes. Thank you so much for stopping by!